NH Galeria opened a show of sculptures and prints in Cartagena de Indias, Colombia last weekend under direction of Nohra Haime Gallery, New York. The exhibition will be on display until March 8th, 2015. 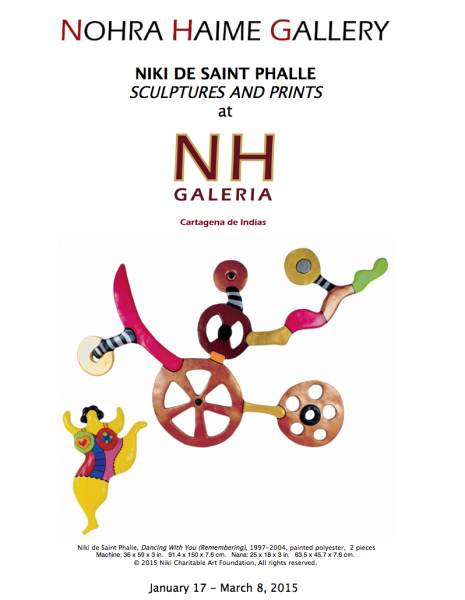 “Niki de Saint Phalle: Sculpture and Prints presents the work of the last period of one of the most preeminent female artists. Through this exhibition, we contemplate the artistic insight and the social and cultural concerns of Saint Phalle about contributing to a better world.